Hello! Just a few days ago my husband Ross & I came home from 10 weeks away in Africa… 4 weeks in South Africa & 6 weeks in Zambia. So many adventures… I have met so many people or have got to know other people better. Each one of them have enriched my life in some way. Why were we so far from home? Ross is the International Director for the MMM International Alliance (MMM was once known as Mobile Mission Maintenance). Part of his job is to visit each of the MMM member centres i.e., Australia (where we live), New Zealand, Hong Kong, Zambia with Associate Centres in Thailand & South Africa. Earlier in the year we were in South East Asia for 6 weeks for MMM related work in Thailand & Hong Kong. My job? As well as the normal stuff of life… Ross appointed me (last year) as his ‘Communications Director’. I think this position probably involves a lot & not much! Maybe somewhere in between depending on what’s going on at the time. I do know that I’m sometimes out of my comfort zone but even so, I enjoy learning new stuff & ‘having a go’. Having said that… this blog is & will be a work in progress. If you know about WordPress blogs or about IT stuff & you would like to help me, you’re welcome as long as you… keep it simple! I’m in transition at the moment… home is great & I love spending time with my family, friends & (Eltham Baptist) church family but after so many weeks away, it’s hard to get back into any sort of routine. (Note… “Be kind to myself”.) Of course, Ross & I are not the same people we were at the time we left home so it’s hardly surprising that it’s hard to ‘settle back’ into life as we knew it before. I’m not the sort of person who normally likes to dive right into the deep end of a pool. I absolutely do not like cold water so I take a gradual approach… one step at a time getting used the temperature of my surroundings so I guess it’s hardly surprising that I get back into ‘normal’ life (whatever that is) gradually. The photo is from a day from our week’s holiday at Cape Town, South Africa. 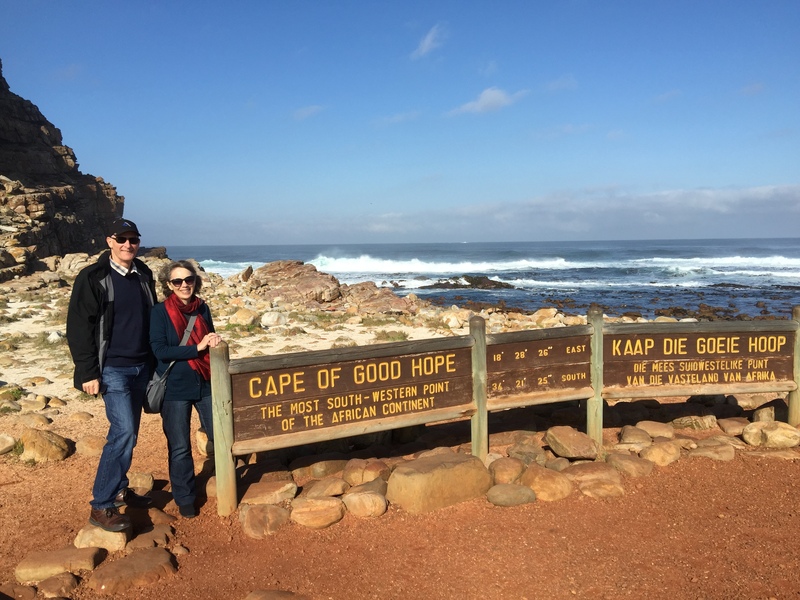 I’ve been hearing about the Cape of Good Hope since I was in high school so it was exciting & surreal to be standing right there!